I’m pleased to announce that on the 24th, the site reached it’s first birthday! 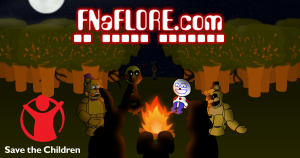 From that time, we’ve become one of the leading resource hubs for the FNaF community. We’ve not quite helped to make people change how they approach lore building, but we’re getting to a point where we’re able to do so ourselves! To celebrate the birthday of the site, we’re running a charity livestream for Save the Children! I’ll be playing against the kind people from the Freddit subreddit, as well as a few guest streamers! The event will take place on the 4th of February. The time on the site should correlate to the correct time for you, but in case it does not, a GMT time is also alongside it! I hope the event will go down well. I’ve managed to sidestep the specific issue I’ve had with streaming, but it’ll still be experimental. We’ll have to see how the community will take it! Please, do forward any feedback to us via the contact form! We’ll soon be rolling out the proper pages you can view the event from. We hope everyone enjoys the show!